As the reception at the Jockey Club was winding down, we ended up with two other couples trying to decide where to go for dinner that evening. It is amazing that with the subject of wine, I can always get a conversation going, especially when the other people are trying to avoid talking “shop” for a few minutes. One of the other gentlemen that I was in conversation with was discussing how he had recently discovered Bordeaux wines and he was all excited about them. I asked him if he had tried any of the Meritage wines from California, and he did not seem all that interested in them, even when I mentioned that they tended to be of the same blends of varietals that he was talking about. We walked across the road to the Grand Hotel and went into the Audubon Bar. 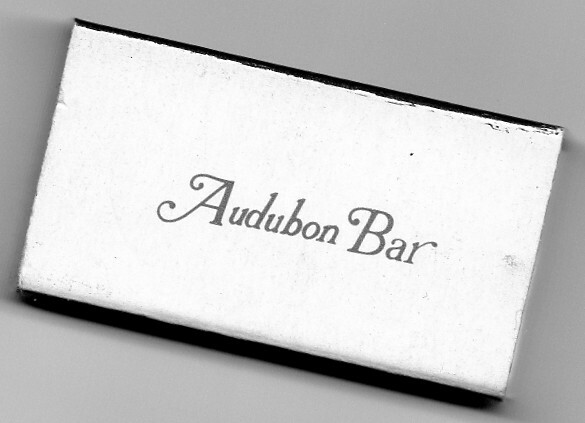 The Audubon Bar is a library with built-in bookcases filled with books, there is art as well, and in today’s lifestyle a mandatory television monitor. It is not a large room, but very comfortable and there is a cigar shop inside as well, but its main use is as a wine bar. It is very peaceful and serene as you would expect from the hotel and we found a charming spot for the six of us, and I requested a copy of the wine list for the bar. I had just randomly opened the book and was on the page for Clarets and I scanned past the First Growths, as we were just interested in having a nice glass of wine, while we discussed where to go for dinner that evening. All of the wines on that page listed the Commune for the wine, or else if it was an Haute Medoc, Medoc, Bordeaux Superieur or Bordeaux, which is how a good list should be laid out. There were some bottles from Pauillac and Margaux, but what caught my eye was a lesser Chateau from Saint-Estephe, which I always enjoy when I get a chance. The lesser wines from this Commune one does not ordinarily find, so I stopped reading the list, if one finds any they are usually from Pauillac or Margaux, which have First Growths. While Saint-Estephe has no First Growths, I have had a chance in the past to enjoy a couple of the Second Growths; Cos d’Estournel and Chateau Montrose. 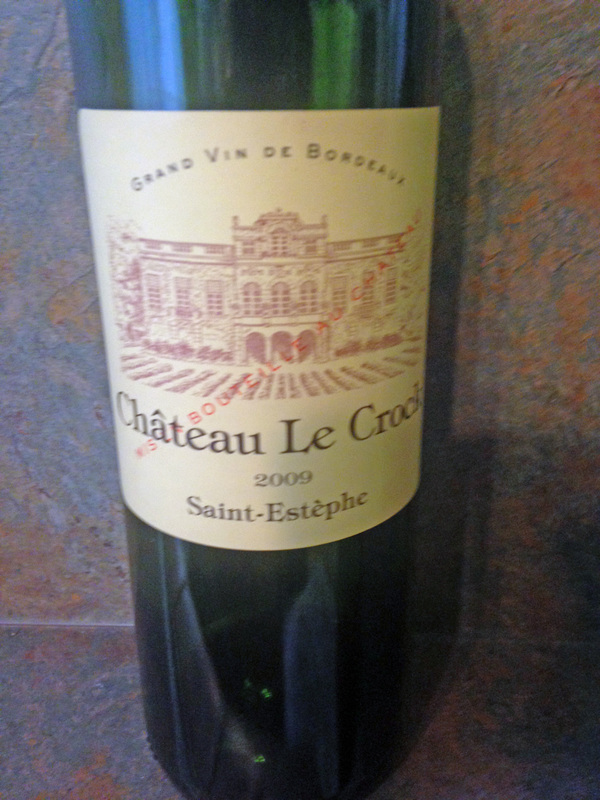 We were all going to have a glass of Chateau Le Crock Saint-Estephe 2009. The wine was everything one would expect from this Commune from the color, the nose and the terroir. The back label was printed I am sure for the American market as it even listed the varietals for the wine, which were Cabernet Sauvignon, Merlot, Petit Verdot and Cabernet Franc. The other thing that caught my eye was a small association label seal that read Cru Bourgeois 2009, now when I selected the wine, since I had never heard of the wine I had to presume that it was of this classification, as I kind of know the names from the Classification of the Medoc of 1855. Chateau Le Crock has been owned by the Cuvelier family since 1903 and they also own Chateau Leoville Poyferre, a Second Growth Saint-Julien wine, which is another Commune that is not often seen here as well. When I saw the seal on the back of the bottle, I realized that it must have been some time since I had a more recent bottle of Claret. The Alliance des Crus Bourgeois now uses the term as a mark of quality. This association has had there ups and downs over the years, and began a new system using blind tasting in 2010 for the 2008 vintage. In September 2011, the vintage of 2009 was tested and tasted, and of the 304 applications, 246 applicants were selected. The other unique item I found out about the Alliance is that there is no carry-over for the entrants from year to year, so they are tasted and tested for each vintage to maintain the status of the award. I feel kind of vindicated, at least to myself, for the reason that I had not seen the seal before, as it is a new tradition. This entry was posted in Wine and tagged Cabernet Franc, Cabernet Sauvignon, Chateau Le Crock, Cru Bourgeois, France, Medoc, Merlot, Petit Verdot, Saint-Estephe. Bookmark the permalink.